It is my belief that there is no recipe for becoming a good dancer- other than making your talent blossom through dedication and consistent work. Therefore, when I establish a teaching relationship with a student, I rely on giving constant feedback and challenges in a nurturing environment, as the means to build good foundations. You will find me teaching you lots of technique, while essential topics such as breathing, posture, presence, musicality and grace are part of every single class. Having fun is also part of it, as this dance form is particularly effective at boosting your mood and energy. I also try to give some background on the original context of the dance, and share what I know about its roots and evolution whenever I have a chance. Regarding who should take my classes.... I've had students from 8 to 63 years old. All body types are welcome, as this dance works with the natural forms of the body instead of against them. Everyone can learn something from this dance. Now, if you dream about or are already involved in performing, I will be most happy to coach you and lead you in this path, striving to help you become the best dancer than you can be. Every ballet dancer knows to start her routine by working at the barre, well, so do we for belly dance. My classes are packed with specific information, yet we take about 10-15 minutes time at the beginning to not only warm up but also condition and prepare the muscles that are essential for this dance form. Not that we use a barre (although it can help if we have it available) but we need to condition, stretch and fortify the body, to create the foundations for isolation and balance. Proper conditioning also prevents you from hurting yourself, which could happen by doing the things the wrong way. For this purpose, I use elements coming from yoga, floor bar and a few concepts of Pilates and Alexander technique. You will get awareness of muscles that you didn't use in other forms of exercise, and a new perception of your entire body. Proper alignment and body image will be developed as well as coordination. If you always thought that you had two left feet, give yourself a chance to overcome that limitation. Although I have trained and perform in many styles (Egyptian, Turkish and American fusion) my classes are mostly based on the Egyptian style, as I have been inspired by the teachings of many of the leaders of the Egyptian dance, such as Yousry Sharif, Faten Salama, Aida Nour, Raqia Hasan and Farida Fahmy, among others. Other big influences were Amir Thaleb of Argentina (who himself profoundly admires Mahmoud Reda's style), as well as Nourhan Sharif and Katia of Boston (also specialized in Egyptian style). "Her class is organized and fun, with a focus on both proper technique and musicality. Her background studying with the Egyptian greats and the Argentinian masters of her homeland, as well as ballet, makes her qualified to teach advanced/professional level dancers. She covers the rhythms of Arabic music, and steps to go with them. She also teaches short choreographic segments to challenge the body and brain. If you aspire to ever perform, Seyyide's attention to detail - not just movements but nuances, expression, posture - will get you closer to your goal. I really appreciate that she watches each student and gives individualized feedback. I can learn much more with the feedback loop than I could at home alone with a video of same class. It takes both a sharp eye and a caring soul to be able to give good feedback on students. For example, one student may receive a tip on arm carriage, while another gets help on foot placement, or muscle engagement - depending on what she could see their individual struggle was at that moment. The feedback is delivered in a kind way, and she only gives what that person at the time can take." "Seyyide is the best belly dancing teacher I went to, she can make me do moves I never dreamed I could. She is always patient, and kind, yet she has a keen eye, and a gift for explaining to you in many different ways till you get it. If you are a yoga student, and you are interested in softening your asanas, and adding fluidity and freedom to your practice, this class is for you." Ruth Knill, students, acupuncturist and yoga practitioner. "Excellent individual instruction even in a group setting. I was skeptical when the class said "open to women of all ages and body types" but this 50+ overweight woman learned to DANCE!!" "I took my first dance belly dance class from Seyyide almost 11 years ago. I had not been dance trained, was (and am) heavy and was scared about the experience but it was something I always wanted to do. I was SO lucky that I found Seyyide. I am STILL dancing, and her training is the key. A dancer highly trained in many areas of dance, Seyyide infuses her classes with professional rigor, yet is just as encouraging and demanding of beginners as she is of those with extensive experience. She is a professional from tip to toe, while also being supportive and encouraging. If you are looking to train as a professional performer or just to experience the joy that this dance beings to so many women (it always touches your life in profound, wonderful ways, including a delightful and diverse dance community in New England), you can't help but benefit from the training of Seyyide. Her solid technique is excellent." "Fabulous teacher. Breaks down moves completely, gives individual attention and feedback to students, teaches choreography, AND makes class fun!" "Seyyide is a classy dancer strong teacher who really promotes technique. I would not be where I am now without her 'yes, you can, now do it again!' coaching! Thank you for helping me do more than I ever thought I could and changing my life with this dance!" Heather Emerson, 2002, student 2nd year.
" I spent a long time looking for a belly-dancing instructor that I felt could teach me both the subtle sensuality of the dance as well as the technique. Seyyide not only embodied the above but she worked very hard to encourage my immersion. In a short time my enthusiasm for belly dancing has increased ten-fold!" Sasha, 2002, student, 1st year.
" 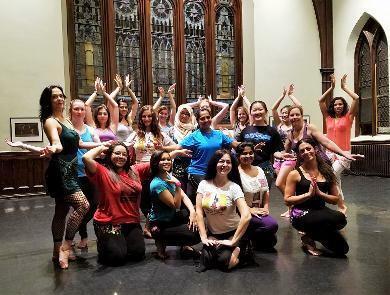 As a teacher, Seyyide makes bellydancing both fun and challenging. She knows each student's strengths and weaknesses, and brings out their best with her warmth, humor, knowledge and expertise." Ginger Webb, 2002, student, 2nd year.
" 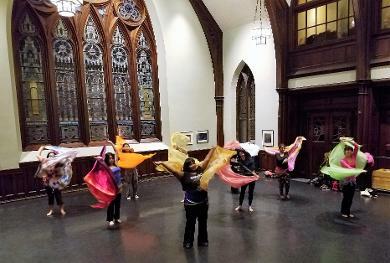 Many teachers will claim to teach belly dance, but Seyyide's classes are the real deal. She is a technical, knowledgable, and deeply caring teacher, with the ability to give advice to students of all levels. She also has such a playful and wonderful presence that I came away from each of her classes in a good mood!" Katie Kemple, 2002, former student, dancer, member of SilkRoad company.